Lex and Lois-bot have headed into space to retrieve the Black Lantern energy spheres that have now all been located. Luthor remarks that the sacrifices of Spalding and Finch and the hassles of having to deal with Grodd, Savage, and Larfleeze are all worth it because of the power the spheres will provide to Lex; power being the thing that Lex craves most of all. But nothing is as it seems. Lex seems startled by the sudden appearance of Brainiac. Lex appears shocked and gravely disappointed to discover that he has been manipulated by Brainiac all along. The Lois robot has been under Brainiac's control the whole time. Lois-bot introduced viral nanites into Luthor's bloodstream when he was wounded on his scalp and the robot dressed his wound in issue #890. In that same issue, Lex was hung upside down, which caused the nanites to rush to his head. The nanites affected his brain, to subtly influence Lex's behavior. Brainiac explains that Lex was manipulated to take the necessary risks to locate and round up the spheres, so that Brainiac could claim them. But wait! Lex reveals that he has been faking his expressions of surprise and shock. His examination of the Lois-bot internals helped Lex to discover Brainiac's plan a while ago. Lex actually anticipated that Brainiac would show up. Lex and Brainiac bicker back and forth; each one criticizing the other's behavior and personality. The bickering leads to a battle, as Lex strikes the first blow, firing an energy beam from his battlesuit. They battle back and forth until Lex inflicts damage and Brainiac retreats. Lex uses his technology to turn the spheres white; and he and Lois-bot watch to see what will happen next. The Earth-bound spheres rise up into space and converge at Lex's location. The spheres combine, and seem to form a portal. A huge and menacing being emerges from the portal. A holographic image of Mister Mind then shows up, claiming that the huge being is his boss. The Mister Mind hologram says that the huge being is from the Phantom Zone and created the spheres from the Black Lantern energy. The spheres were used to create a door to allow the giant being to escape. Mister Mind indicates the he placed scientific clues and news stories for Lex to find. He claims that it was Mister Mind, not Brainiac, that actually manipulated Lex and sent him on his quest; and that Brainiac merely tried to hijack the plan. The Mister Mind hologram tells Lex that there is no power to be had here; only destruction. The Mister Mind illusion claims that Lex's death is now imminent. Also, Mister Mind claims that the huge being is going to end all life in the universe!! Lex now claims that the huge being from the Phantom Zone is afraid of Lois-bot, that Lois-bot has Kryptonian technology inside of her, that the nanites also are Kryptonian technology, and that Lex can control all of it. Then Lex defeats, or maybe destroys, the huge monster, rather easily. Lex Luthor has saved the universe! The battle somehow infuses Lex with godlike power! Story - 1: This wins the prize for the most inane and haphazard comic book I have ever read. It is almost impossible to decipher this story because it changes from moment to moment. The true villain is Lex; no, Brainiac; no, Lex again; no, Mister Mind; no some giant, nameless, powerful but unknown being from the Phantom Zone. We are told that Lex was being manipulated by several villains simultaneously; and that the black spheres bring no power, only destruction. We are told that Lex's quest was all for naught. But then it all changes again! Lex easily defeats the huge monster and that battle somehow gives Lex the power of a god! This story makes no sense at all! I really hate to give bad reviews; but recent issues of Action Comics have been very disappointing. This issue may be the worst of the lot. I apologize for being so harsh; but I cannot find other words to describe the experience of reading this confused book. I really enjoy and appreciate logic in my comic book stories. I really like it when each scene follows logically from the scenes that preceded it. I cannot find any logic here. The story reads as if the author is making it up on the spot; pulling things out of his hat as fast as he can, then changing his mind over and over. Anything goes! Even in the DC Universe, a world dealing with science fiction and fantasy, where fantastic things routinely happen, there must be some ground rules! If this creature is so powerful that it can easily destroy all life in the universe, how come we have never heard of it? How come this universe-destroyer does not even have a name? I must conclude that the huge Phantom Zone beast does not have near the power that Mister Mind says. So how did defeating it give Lex the power of a god? Also, Lex should not be able to defeat Brainiac so easily in their battle. Superman returns next issue. Yay! Then maybe we can put this Luthor series in the past and get back to telling some great Superman stories! I do admit that it will be interesting next issue to see how Superman manages to fight a Luthor-god. Art - 3: Jesus Merino does a very competent job of filling in for Pete Woods. I particularly liked the images of Brainiac, which were well drawn. Cover Art - 4: This cover is very strong. 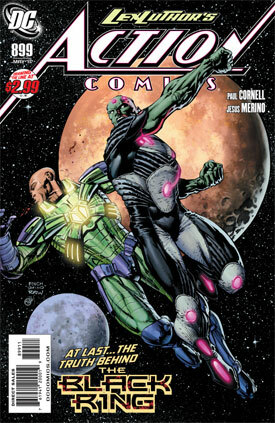 Lex and Brainiac are in space, locked in a battle for supremacy. Brainiac lands a strong right hook, snapping Lex's head back. This cover has action and the thrill of two of Superman's greatest foes in hand-to-hand combat. Too bad the book inside does not live up to the promise of this excellent cover.